This was another activation to further test out my new equipment purchased the previous weekend at Friedrichshafen. I had made a small modification to the Aerial-51 UL-404 so that it would slide over the mast and had replaced the cords on the end of the dipole as the string I had used was water-logged from Rentschen. This was also a summit where my wife would accompany me, at least as far as the cable car top station and then would relax in the sun reading until I returned from the summit. The route to the summit was described as a 15 minute walk with no particular difficulties. So with the weather forecast being very good for the Sunday, I repacked my equipment into one small rucksack, leaving out the previous SOTABeams linked dipole and my 6m squid pole. This time I would rely completely on the new 10m pole and the Aerial-51 antenna. The not currently working Ramsey QRP amplifier would also be left behind along with its cables and the two 5000mAH LIPOs. I would rely upon the 2500 mAH LIPO that I have built into the FT-817 for all power requirments. Rohrkopf is one of the summits in the skiing area above Spitzingsee, which is a tourist area not far from Miesbach about 30km south of Munich. The ski area is reached by a cable car rising about 500m from the lakeside. 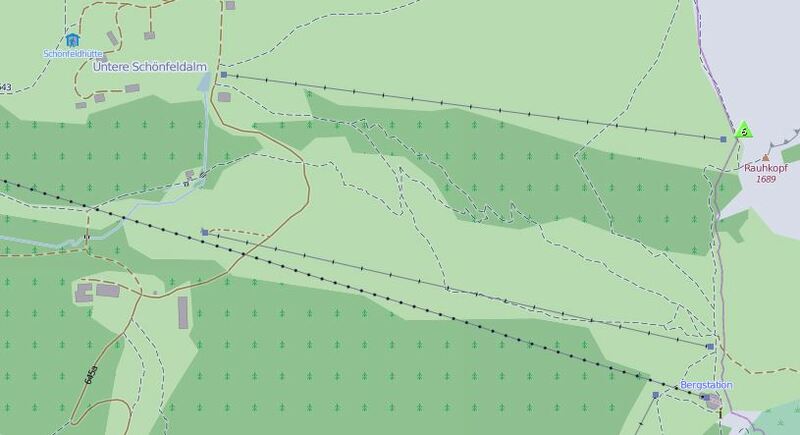 In winter several ski lifts are in operation one of which would take you very close to Rohrkopf but in summer only the Taubenstein cable car runs. This lift brings you fairly close to Rohrkopf in any case. A track that is graded as little or no difficulty by hiking websites should take around 15 minutes to walk from the cable car’s top station across to Rohrkopf. I found some difficulty with the rocks and steep climb in places, possibly due to the weight of my backpack plus my physical condition (not fit enough). In any case if you plan to activate Rohrkopf be prepared for this section to take 20 minutes rather than just the advertised 15 minutes. Once I reached the summit, there is a cross to mark it and the views (of course) are fantastic. This is a summit that lots of walkers come to, in fact it forms part of a waking route that also can take in two other SOTA summits Aiplspitz DL/MF-054 and Jägerkamp DL/MF-053, if one had the time (and energy). Turning the other direction from the cable car, a long route, including two more SOTA summits Miesing DL/MF-057 and Rotwand DL/MF-058, is possible. Rohrkopf is quite busy with walkers arriving every couple of minutes, so I decided to set up a little way back down and off the track. Even here I was asked by many what I was doing (I must get some AR/SOTA brochures in German to take with me). One walker knew exactly what I was doing as he was himself an amateur radio enthusiast, but the majority expressed polite interest and then carried on. Once at my set-up position it was not all easy work. Although I had room to run the antenna out the new cords that I had added to the end of the antenna, replacing the fairly horrible strings that I had on the Rentschen activation, insisted on tangling themselves up with different parts of the antenna. After about 15 minutes of trying to untangle them, I had to resort to cutting them, untangling them away from the antenna and retying them. (I hope to get some better cord on Tuesday that will be thick enough not to tangle so much but still light enough to be easily packed). I used the available barbed-wire holding fence posts to support the 10m mast and the ends of the dipole. Of course upon raising the antenna I had to adjust the cord lengths holding the ends of the antenna and each time I dropped and raised the antenna, the barbed wire grabbed the antenna. It took some time to get the antenna raised at all. I had also made a modification to the UL-404 balun box, adding some screw in loops to the back of it, so that it slips over the squid pole and drops down to the top of a lower section. Unfortunately I had miscalculated and the section I had this drop down to, was one higher than the mast could support the weight at and the mast started to lean over badly. So I had to lower the unit again and then tie it to the correct section as I had done at Rentschen the previous Monday. When I eventually raised the mast for the final time, I decided not to raise it to the full height as I would have to readjust the cords again. The end effect was that I could have taken and used my old 6m mast instead of the 10m one and had less weight to carry. I estimate it took me about 45 minutes to set-up the equipment, by which time I was eager to self spot and get active. 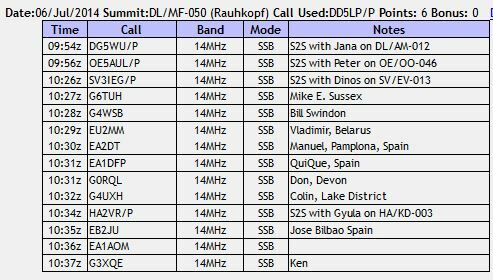 While searching around 20m for a free frequency I happened upon Jana DG5WU who was on another DL SOTA summit, so I called her and we had a short S2S contact, following my call Peter OE5AUL also called Jana from an Austrian summit, as Jana didn’t reply, I called and told her she had another S2S calling her. Still no answer, so I had a quick S2S call with Peter. Later I found out that Jana was activating 3 summits and so most likely had packed up following her call with me. Unfortunately I was no longer on my summit for her later activations. So now it really was time for me to get calling for the chasers – I found a free frequency on 20m and started calling CQ at the same time sending a self spot using the RucksackRadioTool app both as an internet (data) alert and as an SMS. Nothing appeared on RRT. I thought it might be a network issue and as my phone is a dual-SIM phone with two networks, I tried the other network – still no change – no spot. I gave up on spotting myself and called CQ on both 20m and 40m for half an hour with no success. I was receiving some spots though and when I saw Dinos SV3IEG spotted on 20m, I went and joined the queue to work him – another S2S. At this point Mike G6TUH heard me and asked me to QSY up 5 KHz where we had a QSO and he kindly spotted me, after this the calls came flooding in. A good if a little slow to start, activation. More power is required to break in and use a frequency on 40m. Cords and cables ALWAYS tangle when you have limited time. No matter how good or bad they are, but using new cords on a mountain top is not the best place to try them out! I need to revise my mount for the 404-UL balun, so that it slides further down the mast. When I can’t be sure that I will be able to get the 10m mast up, I might as well take the lighter 6m one. NEVER believe track difficultly ratings given on a website aimed at eager walkers! Get brochures in German about Amateur Radio and SOTA that can be laid nearby for those interested to take away. This entry was posted in SOTA and tagged dlMF-050, Rohrkopf, SOTA by VK2JI DD5LP G8GLM. Bookmark the permalink.